Ethylcellulose is a widely used film-forming polymer used to impart modified-release characteristics or mask poor-tasting ingredients. Ethylcellulose is broadly accepted due to its outstanding safety profile and ease of use in conventional spray-coating equipment. Film-coating operations with ethylcellulose can be completed using solutions of ethylcellulose in organic solvents or from aqueous dispersions. ETHOCELTM brand ethylcellulose is the oldest trademarked brand available from The Dow Chemical Company and continues to be an exciting source of innovation. Dow’s constant pursuit of production excellence has resulted in an ethylcellulose product that adheres to exceptionally narrow viscosity limits, contains fewer insoluble fibers, and is reproducibly ethoxylated. With the introduction of the new ETHOCEL High Productivity (HP) grade, these advanced features have been further optimized for use in dry powder layering processes using rotor granulation technology. Traditional spray-coating systems of ethylcellulose rely on dissolution of the polymer into a solvent to apply the coating onto the substrate. The film-formation process occurs by atomizing the solution into small droplets that coalesce on the surface of the substrate, allowing the carrier medium to evaporate, leaving an ethylcellulose film on the substrate. This process is repeated hundreds of times during the coating process, resulting in many layers of ethylcellulose that create a solid, homogenous film. This process is well understood and allows for great film formation, providing stable, reproducible coatings. Dissolution of the polymer into an organic solvent also has some major disadvantages. 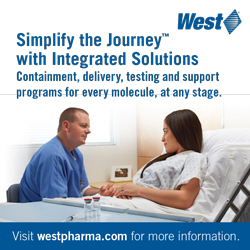 Organic solvent use is widely discouraged from an environmental, safety, and cost perspective. Specialized solvent handling and recovery systems must be installed, and additional process steps may be required to remove residual solvents from the final product. Furthermore, dissolution of the polymer into an organic solvent causes the solvent to build viscosity, which limits the rate at which the polymer solution can be effectively pumped and atomized, resulting in long run times. Spray coating with aqueous polymer dispersions can be used to avoid some of the drawbacks of organic solution processes as dispersions maintain low viscosity and avoid the use of solvents. Unfortunately, aqueous dispersions require additional drying time as well as a lengthy curing step to relax the polymer particles into a coherent film. Rotor granulation technology is traditionally used to quickly and efficiently granulate formulations to improve flow properties and/or content uniformity of the ingredients. This same process equipment can be used to apply a polymer film coating onto multiparticulates, powders, and mini-tablets without the need for solvents or aqueous-based polymer dispersions. The dry powder layering process applies the polymer from a dry state onto a substrate by wetting the substrate with a tacking agent composed of plasticizer and water. Immediately after wetting, the dry polymer powder is applied to the surface of the substrate with the wetting agent acting as a bridge between the dry powder particles and the surface of the substrate. The presence of the plasticizer lowers the glass transition temperature (Tg) of the polymer to allow the particles to soften and fuse in a subsequent curing step. The wetting agent and dry powder are continually sprayed on to the substrates, building additional polymer layers very quickly. After sufficient coating, the dry powder coated substrates are cured through a short thermal curing step, which can often be performed in the unit while the substrates continue to spin in the rotor. The dry powder process greatly improves efficiency as the wetting liquid and powder are directly placed into the substrate bed. The process equipment is extremely versatile, allowing API-layering, polymer coating, and film curing to occur within the same piece of equipment. Dry powder coating requires efficient packing of polymer particles in order to improve film formation. Efficient arrangement of particles is facilitated through the use of polymer particle sizes, which are at least an order of magnitude smaller than the substrate being coated. Few options currently exist for micronized film-forming polymers, which are designed for use in this type of process. An exploration of the impact of ethylcellulose particle size on acetaminophen drug release was determined for 20% weight gains of ETHOCEL milled to various mean particle sizes and distributions. In the formulation, 25% dibutyl sebacate plasticizer was used with respect to ethylcellulose weight and was dissolved in water and added with the wetting liquid. No pore formers were used, and all samples were cured in a drying oven for 2 hours at 60°C. As mean particle size was reduced and particle size distributions were tightened, film formation was improved, resulting in more controlled release of the active ingredient. 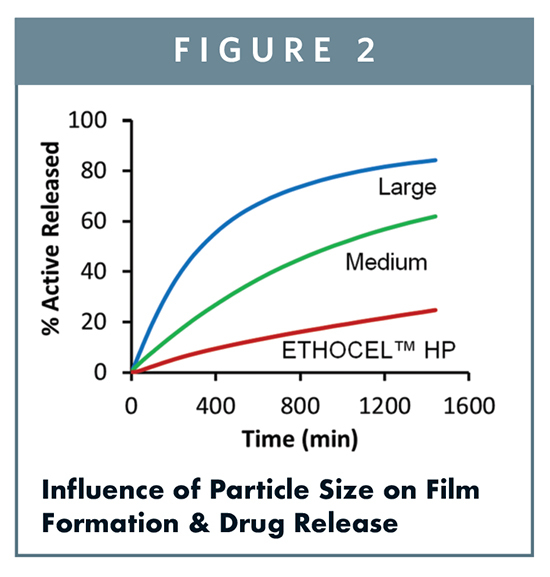 Larger mean particle sizes resulted in highly porous films even after curing, whereas micronized ETHOCEL resulted in a fully formed film and slowest drug release. Metoprolol tartrate drug release was determined for 20% weight gain of ETHOCEL HP. During this formulation, 40% dibutyl sebacate plasticizer was used with respect to ETHOCEL HP weight and dissolved in water. No pore formers were used, and samples were statically cured for 2 hours at 60°C. Metoprolol tartrate drug release was also determined for 10% weight gain of ETHOCEL Standard (Std) 10 Premium, which was dissolved in 90% isopropanol and 10% water. For this comparison, 10% dibutyl sebacate plasticizer was used with respect to ETHOCEL Std 10 Premium weight and dissolved in the same solution. No pore formers were used, and spray-coated samples were not cured. The ETHOCEL HP applied at 20% weight gain has equivalent performance to organic ETHOCEL applied at 10% weight gain without any lag in drug release in the first 60 minutes. Although a higher amount of ETHOCEL HP was needed in this example, total process time was 221 minutes (including a 2-hour cure step) whereas organic ETHOCEL took 293 minutes. Subsequent experiments have shown that an additional 90 minutes of time savings could have been achieved by switching to dynamic curing, resulting in 131 minutes of processing time with ETHOCEL HP. The level of polymer applied to a substrate is often described in terms of the weight of polymer applied versus the initial weight of the substrate. Application of additional polymer, or higher weight gains, results in increasing influence of the polymer; often reduced drug-release rates or increased barrier properties. Dry powder coating follows this traditional pattern, with increased weight gains, resulting in slower drug-release rates. Generally, equivalent performance from a dry powder coating can be obtained from weight gains, which are equivalent to those used with aqueous dispersions of ethylcellulose. Although dry powder coating follows similar conventions as spray coating in terms of the impact of polymer weight applied and is capable of achieving similar drug-release rates, the total process time required to achieve this performance is strikingly different. 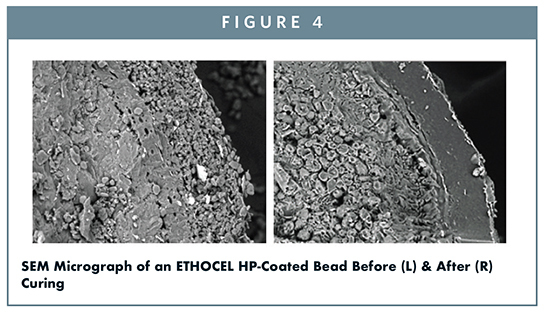 Figure 3 illustrates how the dry powder delivery of ETHOCEL HP Polymers significantly reduces process times for a full-scale 250-kg batch as compared to aqueous ethylcellulose and organic ETHOCEL spray coatings. The data presented includes a 2-hour drying and cure step required for applications of aqueous dispersions of ethylcellulose and a 30-minute cure step required for dry powder coating with ETHOCEL HP. 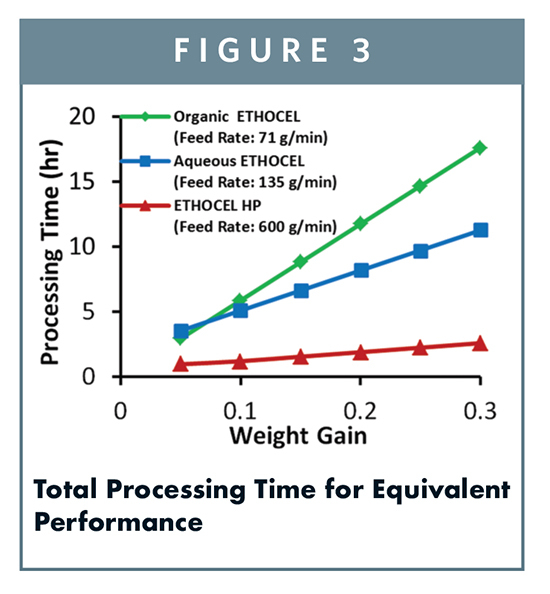 For example, a typical 20% weight gain on a full 250-kg scale batch can be completed in under 2 hours with ETHOCEL HP, whereas a similar coating with organic ETHOCEL solution requires 12 hours, and aqueous ethylcellulose dispersion requires 8 hours. These significant reductions in process time can be realized from small-scale development experiments through full-scale production. Due to the dry powder nature of the rotary coating process, a cure step is required to achieve full-film coalescence. Film coalescence is obtained through appropriate selection of plasticizers during the powder application step and adequate product temperature during a dynamic curing step. This time-saving process allows the film-curing step to take place in the rotor processor in a true one-step, one-pot process. Heated forced air, also known as drying air, is introduced at the end of the coating process to remove residual moisture and begin the curing process while the beads continue to rotate. The result is polished, opalescent beads with a smooth, continuous ethylcellulose film coating. Evidence of full-film formation can be obtained visually as seen in Figure 4 and is confirmed by reproducible drug release upon accelerated stability testing. Experiments have demonstrated that several well-known plasticizers can be effectively used with ETHOCEL HP Polymers. Tests found that plasticizer combinations, especially those with oleic acid, were particularly effective at lowering the Tg of ETHOCEL HP. Selection of an appropriate plasticizer package may be formulation dependent, but for the best results, the product temperature should reach 10ºC above the Tg of the ETHOCEL HP and plasticizer combination. Consistency in drug-release performance over extended storage times is an important consideration for formulation performance and serves to demonstrate that adequate curing of the ETHOCEL HP polymer film has occurred. Tests conducted by Dow and Colorcon found that stable drug release is observed for 20% ETHOCEL-coated metoprolol tartrate multiparticulates prepared with no pore formers and a high plasticizer level of 40% dibutyl sebacate under accelerated stability conditions (40°C and 75% RH) for 6 months. Application of a barrier membrane film can also be an effective means of masking the taste of bitter or foul tasting ingredients. Acetaminophen (APAP) is one such bitter-tasting ingredient commonly used as an over-the-counter analgesic. 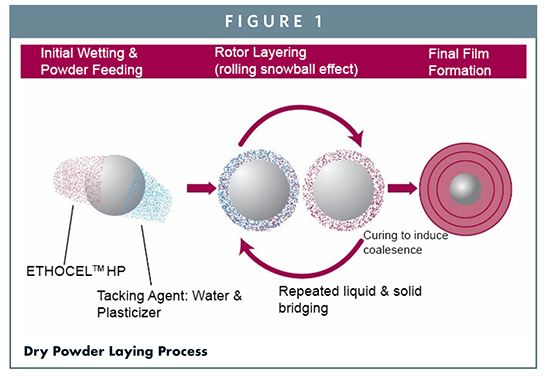 Drug layering of APAP onto sugar spheres was performed using the dry powder layering technique with 5% METHOCEL E5 Premium LV in the binder liquid, followed by application of ETHOCEL HP (20% weight gain) without pore formers using an aqueous plasticizer solution of 20% dibutyl sebacate and 20% oleic acid. The coated spheres were then dynamically cured for 30 minutes using 80°C drying air. The entire process, including drug layering, polymer coating, and curing was conducted in a single piece of equipment and completed in less than 90 minutes. A patented buccal dissolution test was used to simulate the release of the APAP in simulated saliva and found that the ETHOCEL HP was 100% effective at blocking the release of the bitter active ingredient in saliva, as shown in the Figure 5. 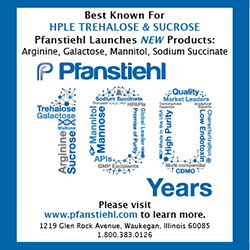 ETHOCEL HP is an innovative new product that helps customers increase productivity while still maintaining the advantages of Dow manufactured ETHOCEL, such as tight viscosity, narrow ethoxyl distribution, and reduced fiber content. Using ETHOCEL HP in a dry powder process could result in 40% to 70% reduction in process time versus solvent and aqueous spray-coating systems. 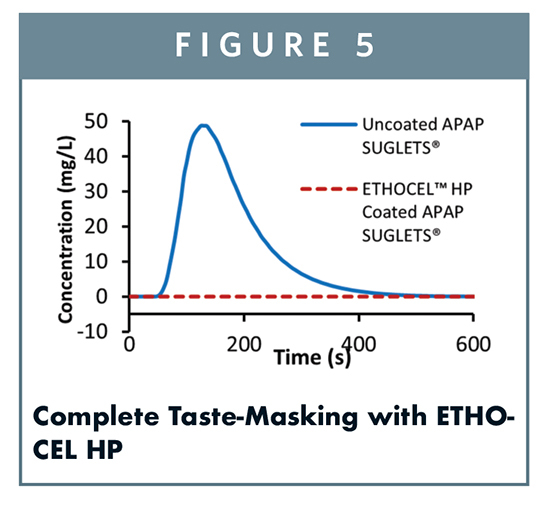 In addition to the controlled-release market, ETHOCEL HP and the dry powder technology can also be extended to taste-masking to help eliminate the bitter taste of actives upon swallowing. Proven to be most effective as a solvent-less coating, this new technology enables processes that are sustainable, environmentally friendly, safer to use, and require significantly less production time. The Dow Chemical Company would like to thank and acknowledge the contributions of Freund-Vector Corporation, specifically Shawn Engels, for producing the drug-layered multiparticulates, which were used in these studies, in addition to equipment training and expertise with their GRANUREX® Rotor Insert. The authors would also like to thank and acknowledge the contributions of Colorcon, Inc., specifically Raxit Mehta and Charlie Cunningham, for the provision of the SUGLETS® multiparticulate sugar spheres, use of their GRANUREX Rotor Insert and stability testing equipment, as well as their study evaluating plasticizer impact on Tg. Finally, the contributions of Cody Schoener and Jason Folkenroth of Dow Pharma and Food Solutions, a business sector of The Dow Chemical Company, are also gratefully acknowledged. 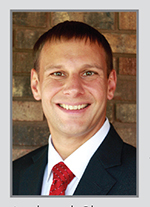 Nick Grasman is the Applications Scientist for Dow Pharma and Food Solutions located in Midland, MI. He began his career at The Dow Chemical Company as an Analytical Chemist, supporting Dow Agrosciences, Dow Microbial Control, and Dow Pharma. He joined Dow Pharma and Food Solutions R&D in 2008 to support advances in modified release applications and solubility enhancement of poorly soluble drugs. In 2013, he took on his current role as the Technical Service Scientist for all pharmaceutical applications of the METHOCEL, ETHOCEL, POLYOX, AMBERLITE, DUOLITE, CARBOWAX, and AFFINISOL products in North America. He earned his BS in Chemistry from Hope College. 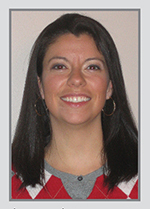 Paula Garcia Todd is the Global Marketing Manager for ETHOCEL, POLYOX, AMBERLITE, and DUOLITE used in pharmaceutical applications. She began her career at The Dow Chemical Company in 2004 as an API Process Engineer for Dowpharma manufacturing, having interned in this field at Merck & Co. She then joined the Dow Pharma & Food Solutions application R&D group and focused on developing new innovations based on customer needs. She then became a Pharmaceutical Customer Application Specialist, providing technical support to North and Latin American customers using Dow excipients and technologies. Following a year in a marketing research role, she moved on to her current marketing manager role. 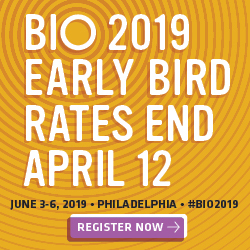 Ms. Todd earned her BS and MS in Chemical Engineering from the Pennsylvania State University; her Master’s thesis is focused on genetically engineering plants to produce therapeutic proteins.